Just north of the South Sudanese capital Juba lies Terekeka state, home to the Mundari, one of South Sudan’s 64 ethnic groups. Mundaris are predominantly cattle keepers but also practice small-scale agriculture and fishing along the Nile, whose water levels rise and fall according to the seasons. The area includes five natural lakes hidden in the swatches of land and inspiring the name Terekeka, which translates as “forgotten” in the local dialect. The water is home to a wide range of fish, including the popular Nile Perch, Tilapia, the Cat- and Mudfish, and offers a great source of highly nutritious food for the community. Terekeka is also the main source of fish for the Juba markets. There is stiff competition among the fresh fish importers, as traders can no longer import from Uganda due to the economic crisis, so resorted to buying supplies locally. As most importers transport their fish on the back of a motorcycle, unrefrigerated, they run the risk of facing losses due to delayed deliveries as a result of the poor roads. Especially during the rainy season this is common, owing to flooding and breakdowns. 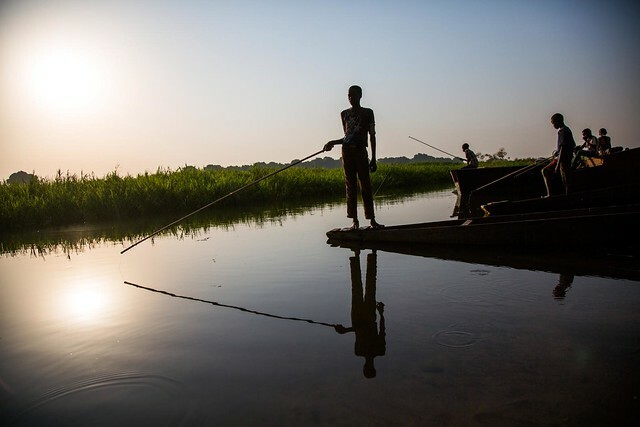 With food insecurity levels rising among Juba’s urban and peri-urban populations as soaring prices, limited income opportunities and disrupted supply routes place food beyond the reach of many, fish supplies are critically important to enhance nutrition. By distributing fishing kits to people affected by a crisis, FAO helps them to re-build their livelihoods and assure food availability for the community. In many cases, beneficiaries have fled from their homes and have lost all their assets and/or do not have the means to replace fishing gear that has been damaged. The fishing kits can provide an immediate source of food, providing a means to survive, but also offer income opportunities to enhance their ability to bounce back after shocks inflicted by the conflict. In 2016, FAO supported over 120,000 households with fishing kits which is estimated to give a family enough food for about six months either through household consumption or sales in the market. As food insecurity has dramatically risen in 2017, FAO will be assisting over 155,000 households with fishing kits over the coming months. The main priority will be to distribute kits to households classified through our assessments as extremely vulnerable, residing mostly in the Upper Nile Region and Southern Unity. With famine declared in the parts of southern Unity on 20 February, these kits offer a life-saving source of food. FAO South Sudan is responding to a complex emergency through the multi-donor Emergency Livelihood Response Programme, which includes the distribution of crop, vegetable and fishing kits and animal health interventions to a targeted 3.2 million people in 2017. This programme is funded by the Common Humanitarian Fund, Norway, UKAID and USAID.